Here is a great song, performed by Sylvia Syms, a singer's singer, a supperclub siren with a tough but appealing style that compellingly conveys the meaning of each lyric. 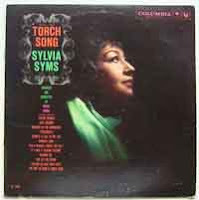 Sylvia Syms (1917 - 1992) was a jazz singer. She was born Sylvia Blagman in Brooklyn, New York. As a teenager, she went to jazz-oriented nightclubs on New York's 52nd Street, and received informal training from Billie Holiday. Her personal friendships with Billie Holiday and Mildred Bailey led to her absorbing elements of their craft. In 1941 she made her debut at a club called Billy's Stable. In 1948, performing at the Cinderella Club in Greenwich Village, she was seen by Mae West, who gave her a part in a show she was doing. Among others who observed her in night clubs was Frank Sinatra who considered her the "world's greatest saloon singer". Sinatra subsequently conducted her 1982 album "Syms by Sinatra". She was signed to a record company by Decca Records, having her major success with a recording of "I Could Have Danced All Night" in 1956. She sang everything from cabaret music to light jazz. Her claim to fame is her versatility in singing, making every song original in its style and sound. During her long career, Sylvia Syms recorded more than 15 albums in several different genres. Her musical contribution is that of singing several different styles of music with one voice. She died in New York City from natural causes, aged 74. Enjoy Sylvia's unique style and voice!